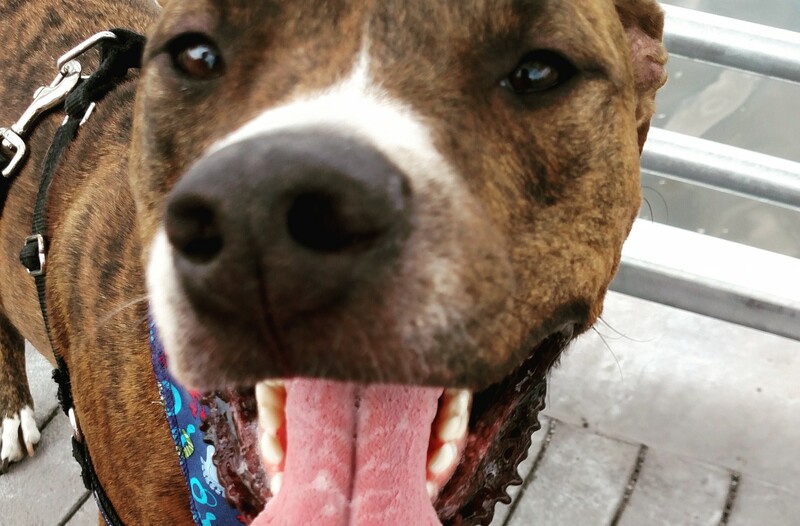 It’s #FureverFriday so King gets a toy break and I – an adopted dog – get to tell my adoption story: My name is Max (short for Maximus) and I am a young #PlottHound mix (only 9 months old!) and am so spry & full of life. I was born somewhere in #Florida in a high-kill shelter & was #rescued by a group in the area and lived on a ranch w/ 75 other dogs. (Can you imagine having that many roommates? It took FUREVER getting ready in the morning!) Even though I did well on the ranch (obviously) and made tons of friends (again, obviously, look at me for God’s sake), there wasn’t much food to go around so I had to learn how to eat quickly. In April, an organization called #TheCatWorks scooped me up (my Mom used the word “scooped” in this storytelling segment – I don’t use words like that, I’m a man!) to help me find a real home with lots of food. It was a really long drive from Florida to #Pennsylvania, but I stayed with a #foster family who was very patient with my young, energetic self while I waited for a furever home. Then one day in May, I went to the toy store and was excited thinking about which toy I would choose, but I got something WAY better than a toy: I met my Mom @tarheelblue022! She was so excited to meet me, and I was over the moon to meet her and have a furever home. Her roommate had just adopted a puppy, too, from #TheCatWorks – named Lenny (pictured here w/ me) – and he is my best friend in the whole world (next to Mom, of course). Mom & I are SO happy together and love playing with each other, going on nice long walks, running around the yard, and cuddling on the couch. I am so happy that I was adopted and cannot wait to spend many, many years with Mom! I already have a furever home, but if you are interested in #adopting any of our friends you met this week, get at me, dawg! Comment or DM me here or tweet King @wheredogsrule. There are so many #dogs in need of a home, and we would jump (literally) at the chance to connect you to them. Every Friday, King drops the mic for an adopted friend of us his to share his/her story. If you want to share yours, contact him. And remember, #KING is #wheredogsrule.